Hello everyone! It’s been a little while since my last post, I’ve been busy with other things and honestly haven’t had that much time to scrap but there has been some things going on that I wanted to tell you all about so that’s why I’m writing this post (not that many actually read this blog but if you do – thank you! I appreciate it!). Before moving on to the layouts I will start with an exciting announcement, at least I think it’s exciting haha! 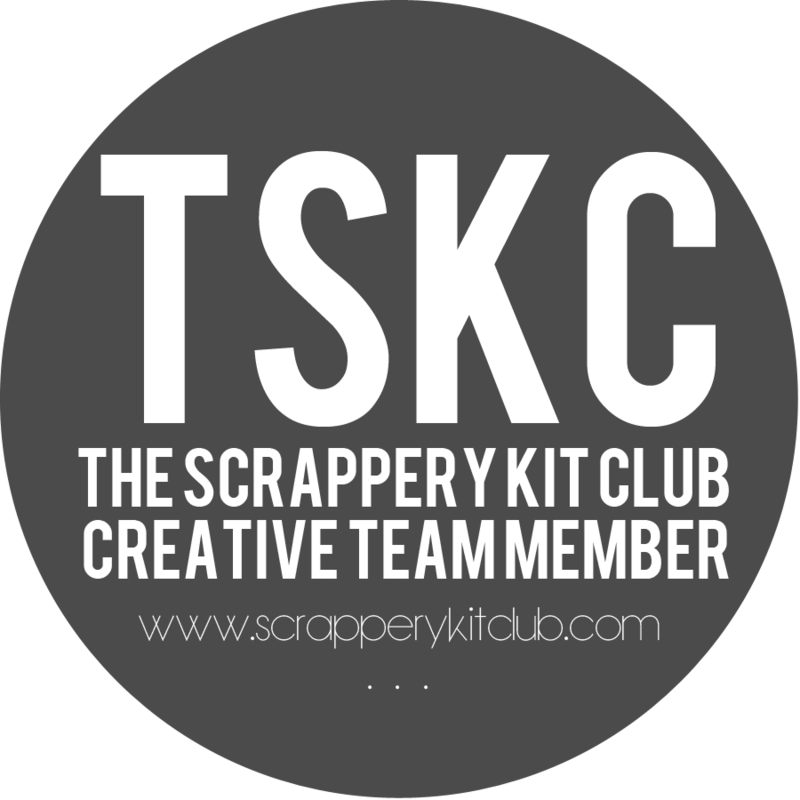 I am going to be a Creative Team member for the Scrappery Kit Club! If you don’t know about them (yet); they are an Australian based kit club and their kits are gorgeous. I never expected to get on so to me it’s almost like a dream come true. You should definitely check them out and see if their kits are for you. I can’t wait to receive my first kits and start playing! Okay, so this is not really any news about me per se but who else is in love with the new Maggie Holmes Shine collection she revealed a couple of days ago? I am seriously in scrappy heaven thinking about all the lovely products that are coming with the collection (except for the zebra, the zebra can go back to the zoo). The papers are gorgeous – this might become my new favorite Maggie Holmes line so far. If you haven’t seen them yet, check it out here . So yesterday I had a little scrap marathon because I decided to finish up the Maggie Holmes Confetti collection because I’ve had it for 6 months and honestly I am just over it at this point. I was planning on recording all the processes for the layouts but I only ended up recording 2 so I will start with the 2 layouts I made that don’t have a process video. 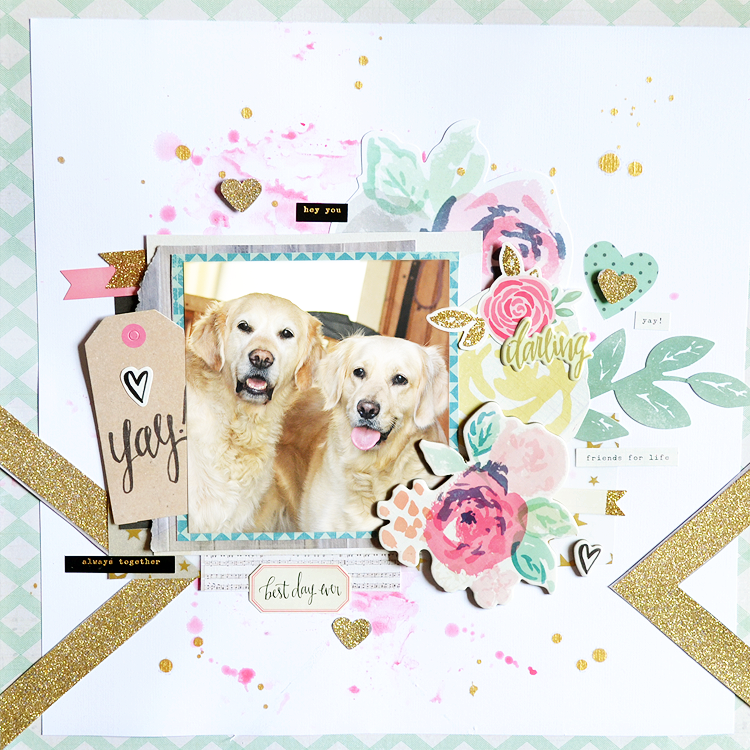 This is actually the last layout I made with the collection and as you can see I am using a photo of my 2 dogs Amber & Amy. I am loving white cardstock these days but to add a little bit more interest I added some pink watercolor on to the background using the plastic packaging technique. My whole ‘concept’ for this layout was to create a big flower cluster around one side of my photo using up the remaining floral pieces I had left. The layout it self may be quite simple but sometimes less is definitely more and I am happy with how it turned out. I actually wish I was recording my process for this one since I think it could have been an interesting one. 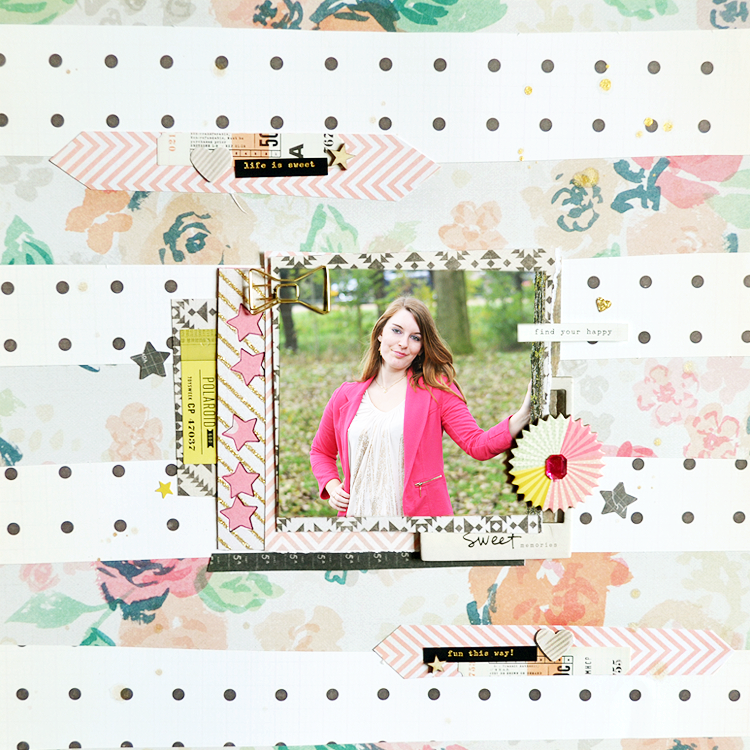 I finished off the layout by adding some Heidi Swapp gold color shine. My idea for this layout was to ‘replicate’ THIS layout I made a while ago (I know I failed lol) and to do that I used that floral paper as my background and then cut some strips off of that black polka dot paper (which is from the Crate Paper Craft Market collection) to kind of get a similar background as the layout I mentioned earlier. 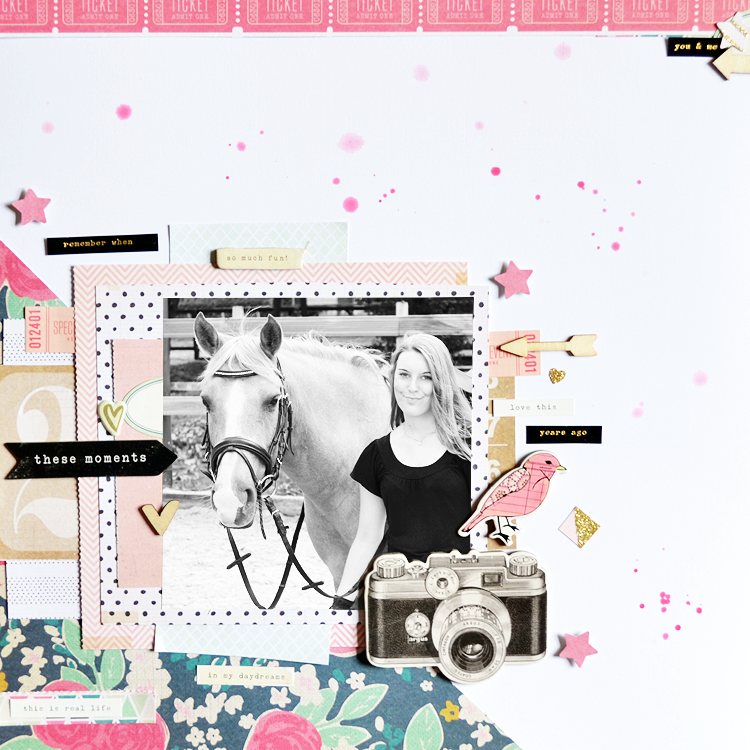 I think that layout is one of my favorites ever and it’s such a good way to use up scraps that I will definitely make something similar in the future. Anyway, back to this layout, I used a photo of me (what?!) and I had this scrap piece of paper laying on the side of my desk with some stars punched out of it. I thought it could be a nice idea to mount a different piece of paper behind those stars and incorporate it into my layout. If I would have known that beforehand I would have lined the stars up more properly lol, but it doesn’t bother me too much. I then outlined it with a black fineliner to give the stars a little bit more definition. I made 2 little clusters using a strip of scrap paper and some little bits and pieces. I am not really sure how I feel about this one to be completely honest, I guess I can call this a ‘filler page’. This layout was actually really quick to do, I think it took me about 20 minutes. I am using my favorite color combination for this one; pink, gold, white and black. The photo is just a photo of Amy I snapped a few months ago and I just thought it was a super cute photo. I used up a few scrap pieces of paper that were on my desk and I love how the vellum piece looks on the layout. Picking out the embellishments was easy since there wasn’t a whole lot of choice left haha. The ‘darling’ acetate piece was perfect for this layout, I didn’t know if I was ever going to use it, but when I put it on there it looked like it belonged there and it works great for a title. I have had some troubles using up that gold chipboard bow but just like the acetate piece, it seemed like it was waiting for this layout (lol!). I added some of those amazing tiny words/phrase stickers and some gold color shine and that was basically the layout done. I must say that even though it’s quite simple I really love how this one turned out. For this one I am using white cardstock again and I thought it would be a nice idea to cut over that floral paper diagonally and put it on the left side of the page to add a little bit of pattern on to it. The photo is of me and Cupido (now known as Romeo), it was taken 2 years ago when he was still my horse and I just love the photo. Again; I didn’t have a whole lot of things to work with but I knew I wanted to use the chipboard camera on this page (or try to anyway). This was also the first page where I used my new star punch on and I am loving it! It’s nice to add something other than hearts haha. I put them on foam squares to add some dimension to my page. I really like the contrast of the black and white photo against the colors on this page. I added a small cluster at the top to give it a little bit more interest but I didn’t want to add to much so I kept it fairly simple. Thank you so much for joining me today! I filmed my Kill The Collection video today so I’m hoping to upload that in a few days from now. I hope you will have a great day/weekend.